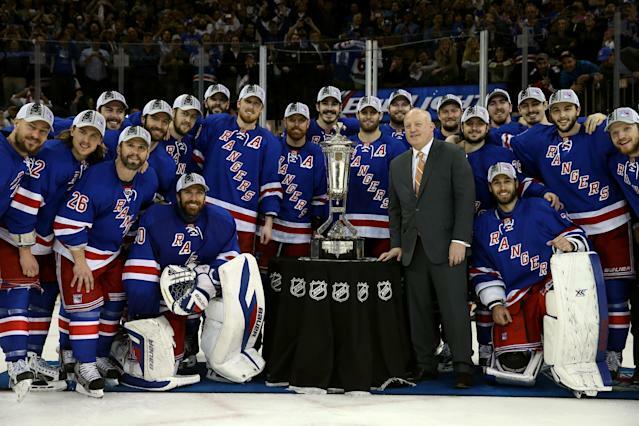 How did NY Rangers handle trophy ceremony without captain? When the trophies start being handed out, it’s tradition in the Stanley Cup Playoffs that the team captain from the winning team is the one that receives it (although, unless it’s the Holy Grail itself, doesn’t touch it). The Rangers, however, don’t have a captain. They traded him, as Ryan Callahan was sent with draft picks to the Tampa Bay Lightning for star winger Martin St. Louis back in March. The Rangers sent out their three alternate captains: Defensemen Dan Girardi and Marc Staal and center Brad Richards. None of who touched the trophy. There was some speculation that Henrik Lundqvist, the team’s star goalie and playoff MVP candidate, could be the choice. But they opted for the three guys wearing the ‘A’. There hasn’t been a Stanley Cup champion without a captain since the 1972 Boston Bruins. So what happens if the Rangers win the next round? Three-way Cup raise?